This month, 1-306 has been learning about identifying their own emotions at school as a first step in recognizing their own and other peoples’ emotions. This work has involved building a vocabulary around feelings of pleasantness as well as energy levels. As part of recognizing our emotions, 1-306 has practiced noticing physiological cues (such as rapid breathing) and tuning into emotions around them such as facial expressions, body language and vocal cues. Ask your student about the Mood Meter that 1-306 is using in the classroom. During Reader’s Workshop, 1-306 has been reading nonfiction books and identifying how certain nonfiction features serve a book. As students have developed their understanding of nonfiction texts, they have continued to think about how nonfiction books can surprise them in the same way as fiction books. This month, 1-306’s Reader’s Workshop is also emphasizing engagement, book choice and longer periods of independent reading. Ask your student how they know if they are reading interesting books. In December, we will continue to explore nonfiction texts. We will identify additional nonfiction features and the purpose of each feature as they relate to our Seed Study. We will practice using text features to locate important information in our books and we will study different texts on the same topic, noticing how the information presented is similar and different. We are typically having two read alouds each day that model much of the reading work your student is working towards: thinking aloud about what we know, have learned and noticing what we still wonder. You can support your child as they read nonfiction at home by discussing features, facts, and wonderings as they read. Is your student bringing home 3-4 Just Right Books each night? Continue to support your student in being responsible for their book bag, choosing appropriate books and returning them each day. First graders are planning and writing fiction stories. An important part of this process is learning to choose primary and secondary characters, settings, a kickoff (or problem), events, and a tie-up (solution). Another important component of Writer’s Workshop has been giving students enough time to write independently and allow their stamina and engagement to grow. In December, first graders will be working on elaborating and editing as they revise, adding dialogue, character thinking and feelings. They will continue to work on conventions through the use of an editing checklist. Much of the coming writing work will involve using checklists, many of them generated by the class. The big idea around this work is thinking about when and how a writer knows that their fiction book is complete. We’ve also used oral storytelling to tell stories to each other. First graders have created many interesting characters and events. You can try this activity at home by taking turns naming a character, setting, kickoff, events, and a solution. This month, first graders will be sharing their fiction stories with their Little Reading Buddies! Additionally, as we continue our Seed Study, first graders will be doing more consistent observational writing about their plants. First graders completed a unit on doubling. We studied partners and pairs and played many doubles games to help us learn our doubles facts (as well as near doubles). This past month, we have been learning about the various ways of solving problems through story. First graders have been identifying the most important parts of a story, visualizing and acting out the action before deciding what operations, tools and strategies are necessary to demonstrate the process of solving. Ask your student about the various problem solving steps and activities to show work we have been doing at school. This month, we will begin a geometry unit of study about the attributes of shapes. We are learning that shape, size, and color are attributes that we can use to name and sort shapes. We will learn that different shapes can share attributes (e.g., both rectangles and squares have 4 sides) and that shared attributes can be used to define a larger category (e.g., quadrilaterals). In Seed Study, students observed, sketched, and wrote about seeds through dissecting various fruits. We have also gone on field trips to Governors Island, the Brooklyn Botanic Garden and Union Square Greenmarket to expand our understanding of the seed lifecycle. This month, we will begin to explore how seeds travel. Students will use straws to explore how seeds move through air and water and notice that different seeds move in different ways. In the upcoming weeks, we will continue to observe our growing plants. We will also continue to explore the conditions that a seed needs in order to grow well. -Thursday, December 20: Family Morning, 8:45- 9:15. -Please note that birthday celebrations will continue to occur on a monthly basis at the end of the month. We will put parents in contact with each other to coordinate items. To emphasize classroom community, birthday celebrations are with the class only. -Scholastic Book Order Forms have been going home, please let me know if you have any questions. -First graders are bringing home their sight words at the end of each week, please continue to work on them over the weekend using suggested practice ideas. -If you are not following our Seesaw account, please do so now! Expect at least one post each week. Happy Halloween! We are 37 days of school into first grade and so much community building is taking place in 1-306. 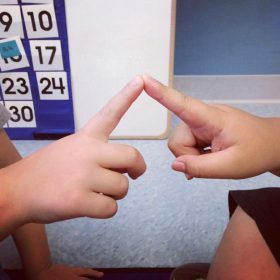 First graders continue to practice taking care of each other by asking questions and listening during morning shares, using non-verbal hand signals to communicate, following our classroom agreements and advocating for themselves while using clear and taught language. In the classroom, students will share how they deal with difficult feelings or resolve conflict. Role playing scenarios is something you can do at home with your student if they are experiencing tricky situations. During class discussions or meetings, we have been using a model called “whisper-and-talk,” which allows students to turn to a peer and share their ideas. When we come together again, whisper and talk partners have a chance to share their thinking with the larger group. This month, each first grader applied for and was assigned a classroom job. Do you know what your student’s classroom job is? First graders have many opportunities to help out our classroom, each other and grow as responsible first graders. Our yearlong theme of togetherness will continue as first grade becomes more and more kind, caring and independent. 1-306 students are learning how readers make book choices. In the classroom, your first grader reads from their book box each day and selects books to take home in their red book bag for reading at home. As your student continues to learn how to shop for books, they will grow as engaged and independent readers. They will also learn how to choose books that are “just right,” books which they can read and understand independently. This month, 1-306 has been doing reading work that focuses on identifying the story elements of a fiction book. First graders are using tools such as their retelling bookmarks to think about the components of a fiction book and how retelling supports their comprehension. Continue to help your student at home by discussing the title, characters, setting, kick-off, events and tie-up of fiction books you read together. First grade will continue learning about how fiction books have problems, events that are more important than others and characters that change because of those events. Each Wednesday, we visit the school library to listen to a read aloud, browse books and choose a book to check out from our school librarian. First graders have been doing some focused writing during Writer’s Workshop. This month, we have been thinking of ideas based on our own lives: people, places and events that are important to us. Students are using their writing folders to organize their ongoing work as well as reference teaching points from small group work when writing independently. Many students also use our classroom word wall to reference our weekly sight words that have been going up. First graders are drawing inspiration from their picture collages (thanks to our last Family Morning!) and their own life to write pieces, or “Moments,” which include descriptions of dialogue, feelings and senses that add details or “stretch” out their writing. As students plan out their stories, they have been using transition words such as “first,” “next,” “then,” “after that,” and “finally.” Practice telling stories using these transition words to support your student “stretching out” a story and adding details that involve their senses and feelings. 1-306 has been doing a lot of work to learn about the relationship between doubles and counting by twos. The big idea supporting this month’s math unit has been exploring a double as a number composed of two equal groups and what it means to be an even or odd number. First graders are playing various games to learn their doubles facts. Many students know easy doubles (1 + 1, 2 + 2, 3 + 3, 4 + 4, 5 + 5, 10 +10), but struggle with trickier doubles (6 + 6, 7 + 7, 8 + 8, 9 + 9). We are beginning to skip count by two’s and use doubles to help us solve near doubles (i.e. “If I know, 5 + 5, I also know 5 + 6 because I add one more”). Students are working individually and with partners to represent their thinking when problem solving. As student understanding has grown, first graders are noticing that it’s much more efficient to represent objects symbolically (such as with circles or x’s) rather than with elaborate drawings. We are working hard to learn from one another’s work and to revise our own work as we develop new ideas and strategies. We are very excited to begin our Seed Study inquiry unit for our first content study. We launched this unit by sharing what we think we know about seeds and brainstorming questions that we have. As the study continues, some essential questions that will guide our thinking are “What do you need to know about seeds to help them grow?” and “Are seeds living things?” We will soon begin dissecting, sorting and sketching seeds next week. We also have three Seed Study field trips planned for November! During the past fifteen days of school, 1-306 has been working hard to build our classroom community. We discovered classroom materials, learned about our schedules and routines, established hopes & dreams, and generated classroom agreements, or rules. The time dedicated to building this foundation will support an efficient, fun and safe learning environment for the rest of the year. A theme for the 2018-2019 school year will be togetherness. During these first six weeks of school, we will continue to take opportunities to get to know one another. Some activities that have allowed us to do this are Morning Meeting, class discussions and dedicated time for sharing such as our Closing Circle. Every day, we have interviewed a Student of the Day. During this process, students are asking class-generated questions, developing their listening skills and learning about their friends. This is also an opportunity for shared writing and reading. Literacy is an integral part of our day. It can be found from the Morning Meeting to Math. In September, we launched Reader’s and Writer’s Workshops. We focused on developing good habits for self-selecting books, taking care of books and reading long and strong. Every morning, 1-306 reads quietly in their independent reading bubble for an ever-growing amount of minutes. They are working on selecting and reading “just right” books, which are not too easy (“downhill”) or hard (“uphill”). As students start to select their own “just right” books and keep them in their book box, they will be able to develop more independence in how they choose and engage with books. Our schedule allows for us to visit the school library each week. (Our first visit will be next Wednesday and our librarian is 1-306’s own Sarah Scogin!) As first graders become familiar with library routines and expectations, they will begin checking out books each week to keep in our classroom. Additionally, 1-306 has two buddy classes they will be meeting with regularly: a pre-k class of “Little Reading Buddies” (our first visit is next week!) and fifth grade class of “Big Reading Buddies.” These opportunities will facilitate a love for books and reading in your student. In October, the class will be diving into fiction stories and learning about the components of a story that are most important to readers. As writers, students in 1-306 are building stamina, drawing from their own life experiences and exploring taught craft and features. An important goal for the first part of the year will be cultivating independence in student writers. As part of this process, students are integrating writing folders into Writer’s Workshop, a tool which will allow them to organize their writing progress as well as reference mini lessons and conference notes. This month, first graders have been learning about what writers can write about and strategies to use if they feel stuck. In the month of October, first graders will write about important moments in their own lives, stretching out those moments to add interesting details for their reader. 1-306 students have been working on being organized and focused mathematicians. Games such as “I Built Ten!” have helped students develop independence and demonstrate their number sense. Many of the games your students have been playing are familiar and allow them to work on their fluency (such as ways to make 10). Ask your student about the math games and other activities they have worked on in the classroom. Another regular math routine has been Days of School, allowing students to look at the various ways to count, group and notice patterns in the growing number of school days. 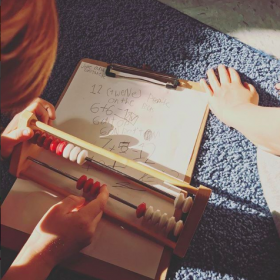 Ten frames, rekenreks, bead strings and hundreds charts are just some of the tools used for math routines. In October, we will begin a unit on doubles in addition and how to represent thinking on paper. By using the context of pairs, students will be able to create meaning behind doubles facts and grouping. At home, engage your student when counting pairs and single objects. During the past month of school, we have been reading various genres of books, including character and author book series (such as Little Critter and books by Ezra Jack Keats). We have also been reading books about feelings and how we can acknowledge certain feelings at school when sad, angry, upset, etc. As our Peace Place and social/emotional work continues, students will be taking a stronger lead in having agency over their own tricky feelings this year and engaging in strategies that lead to communication with each other. -Thank you to Katherine Issel (Maddie) and Lily Wicker (Kaia) for being our class parents! -We will have an America Read Tutor named Diana spend a few days each week in the classroom to support students in literacy activities. -A sheet with questions to ask your students went home this week. -Handwriting and Sight Word homework is going home each week. Students will benefit from the practice and do not need to return their homework to school. -Dreambox info sheets with log-in information were backpacked home this week. Hello! My name is John and I am going to be your new teacher. I can’t wait to welcome you to first grade. This summer, I have been spending time with my family in California. 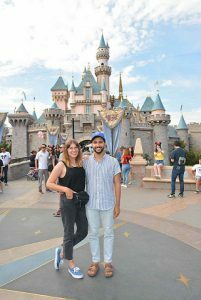 We went camping, visited friends and went to one of my favorite places: Disneyland! Below, you can see a photo of me and my wife, Claire, in front of Sleeping Beauty Castle. Soon, it will be the first day of first grade. It’s good to share feelings out loud when something new is going to happen. I feel excited and a little nervous about the first day of school. How do you feel? If you can, share with someone how you feel about starting first grade. When we see each other, I am looking forward to talking about all of those feelings as well as listening to your summer stories. If you want, you can share with our new classroom community on the first day of school. I can’t wait to meet you! I am thrilled to be teaching first grade. 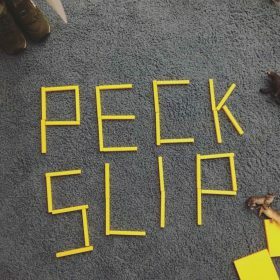 It will be my sixth year at the Peck Slip School and I am so excited to start the 2018-2019 school year. 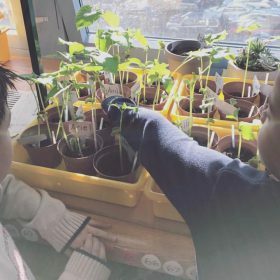 I love teaching first grade – this is a year where your student will see immense growth, becoming more thoughtful and independent thinkers through shared experiences. This fall, we will integrate our academic learning with one of the content studies we have planned (along with a strong emphasis on social and emotional learning). As the first day of school approaches, I will be preparing the safe and fun learning environment that will be your student’s classroom. This year, your student will embark on a truly special time of their life, one in which they will become Readers, Writers and Mathematicians among so many other things. Most importantly, they will become more adventurous learners, growing individually and within a group that is compassionate and encouraging. I look forward to fostering a community that is active, open and supportive – one in which every member is constantly learning from each other. I’m also excited to meet each of you and get to know you as we work together during the school year. 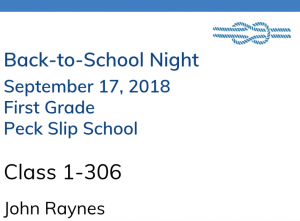 Thank you, and at the start of the school year, I can be reached at: jraynes@schools.nyc.gov.